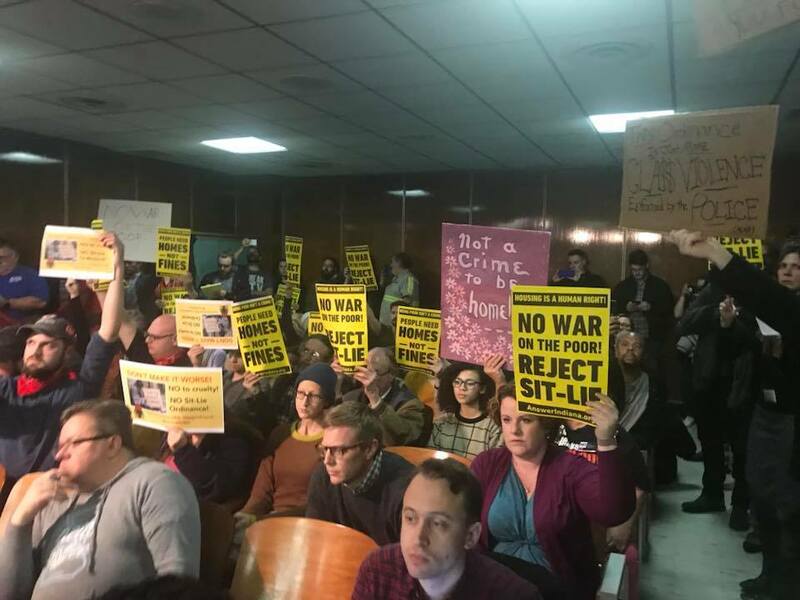 Approximately 100 people packed a committee meeting of the Indianapolis City-County Council to demand that councilors reject a proposed “sit-lie ordinance.” The ordinance would criminalize sitting and lying on the sidewalk in the heart of downtown Indianapolis between 6 am and 12 am. McQuillen read out a preemptive justification of his legislation, arguing that people had come to him afraid to go downtown. This was met by laughter from the gathered residents. McQuillen then went on to claim that somehow this ordinance would in fact help the homeless, though he didn’t explain why it would. Individuals experiencing homelessness testified about their own struggle to survive in a capitalist system that, far from assisting them, criminalizes them and shoves them out of sight. Others connected the struggle of the homeless to the struggles of people with disabilities and people with mental illness. Organizers for Answer Indiana, the Indianapolis chapter of the ANSWER Coalition (Act Now to Stop War and End Racism), condemned the ordinance as an act of class war carried out on behalf of a morally bankrupt class of billionaires.